A Gorgeously Green Wedding, Housewarming, Christmas or Birthday Gift. Make their life easy! 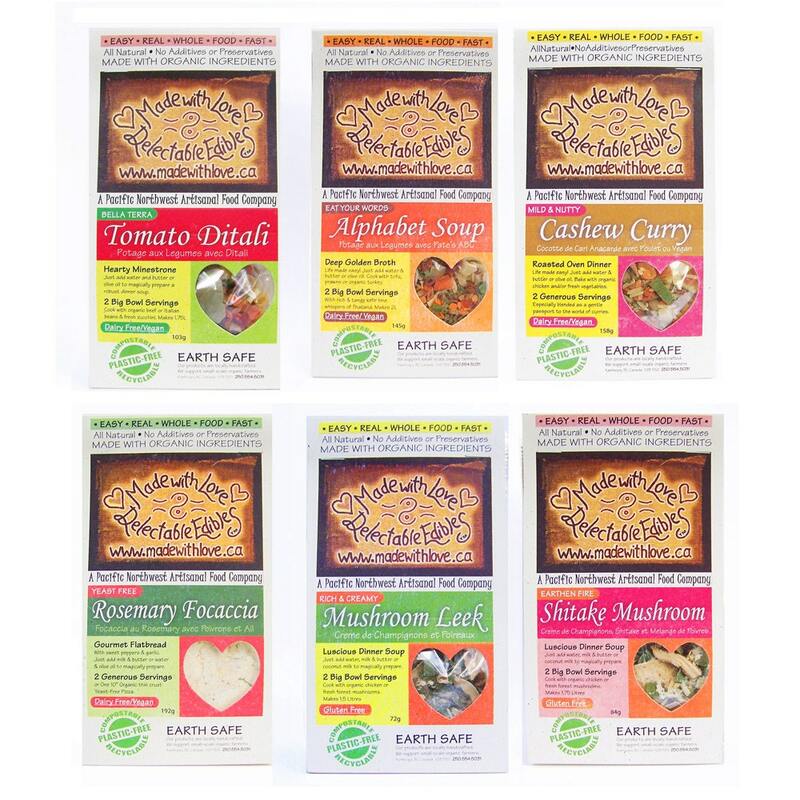 All six Magic Meal Mixes make dinner times a breeze! Each Magic Meal Mix makes two huge big bowl servings of healthy gourmet meals just like magic. Just add water/milk, oil/butter & a couple fresh ingredients for relaxing eco gourmet whole food meals, made with love in your own kitchen. 5 minutes or less prep plus 15-60 mins cook time. Step by step recipe directions on every package. And everything comes nestled in our signature eco gift box with dried herb, flower & earth inspired stuffing and your personal message handwritten on a note card. Each plastic-free, compostable cello bags is hand filled with six different delectable blends of natural and organic grains, veggies, herbs and spices. All flavours can be made with organic meat or chicken or strictly vegetarian/vegan add-ins as desired. A nourishing gift for the spirit and a real blessing from our earth. 100% natural, handcrafted artisan blends of grains, seeds, nuts, lentils, veggies, herbs and spices. Simple whole food pantry staples with home made heartwarming real whole foods, a twist of fusion fare & earth trekking adventure... feed yourself and your loved ones very well, while simultaneously nourishing self with calm simplicity and ease. All six are Vegetarian [ 4 are Vegan / Dairy-free & 3 are Gluten-Free] DIY Magic Meal Mix options are included. All can be made with omnivorous meat recipe options and fresh veggies as desired. Made with Love Artisan Magic Meals Master the Art of Simple Gourmet Cooking! Just mix with a few fresh ingredients and Voila! Tell all your friends " I made it myself - its Made with Love". OR Look and Cook! Follow along with Easy Real Whole Food Fast! VIDEO RECIPES ONLINE to make healthy Magic Meals in minutes. Made with Love is Earth Safe: natural, hand-crafted, 100% Plastic-Free and sourced from the healthiest ingredients with the long-term health of our bodies and planet in mind. Traditional blends with a twist of fusion fare & earth trekking adventure... A gift for the spirit and a real blessing of the Earth. Make magic gourmet meals with your own free range chicken or meat OR Vegan, Gluten-free, Dairy-free, Vegetarian recipe options all included. * For Gourmet No Fuss One Dish Entertaining Add: Chicken/ Tofu/ Shrimp and fresh cilantro. * For Gourmet No Fuss One Dish Entertaining Add: Organic Chicken &/or baby potatoes & corn. * For Gourmet No Fuss One Dish Entertaining Add: Scallops and Asparagus. Our Kitchens blend products with legumes, nuts, dairy, wheat & other known allergens We conscientiously clean between all batches with our allergenic loved ones in mind. Please visit http://www.youtube.com/madewithlovechannel to watch our weekly TV cooking show Easy Real Whole Food Fast! and find hundreds of simple, easy, no work recipes to make healthy gourmet meals in minutes.